Today is 3/14….. do you know what that means? It’s Pi Day. π (or Pi) is a mathematical constant that is the ratio of any circle’s circumference to its diameter. π is approximately equal to 3.14. I know it sounds confusing, but in mathematics it is one of the most important mathematical constants. So, since today is March 14th or 3-14 it is considered Pi Day. 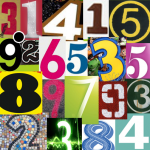 With that being said we are going to work on a collage surrounding all the numbers in Pi. So, grab the materials needed and let’s get started.